Amputees can control their prosthetic arm essentially by thinking about the movement they want to perform, and their prosthetic fitted with an electrode array picks up neural signals and triggers the movement. In a demonstration Monday at the AUSA show, retired Sgt. 1st Class Glen Lehman showed how it works. Lehman lost his arm when he was deployed to Iraq in 2008. Now he wears a prosthetic arm equipped with the neural-control technology, and demonstrated six movements he can prompt the arm to do. The technology is called the Coapt pattern recognition system, developed with support from the U.S. Army Medical Research and Materiel Command. “Using a prosthetic can be very tiring, like doing Crossfit eight hours a day,” Lehman said during the demonstration. With the pattern recognition system, as long as you can maintain a pattern of movement, you can train the prosthetic, and that becomes easier for the user, he said. “I don’t have to constantly readjust my arm, I can retrain it myself. The arm learned me,” said Lehman, who spent six months recovering from his wounds at Walter Reed Medical Center, medically retired from the Army in 2010 and has gone through many prosthetic devices since then. 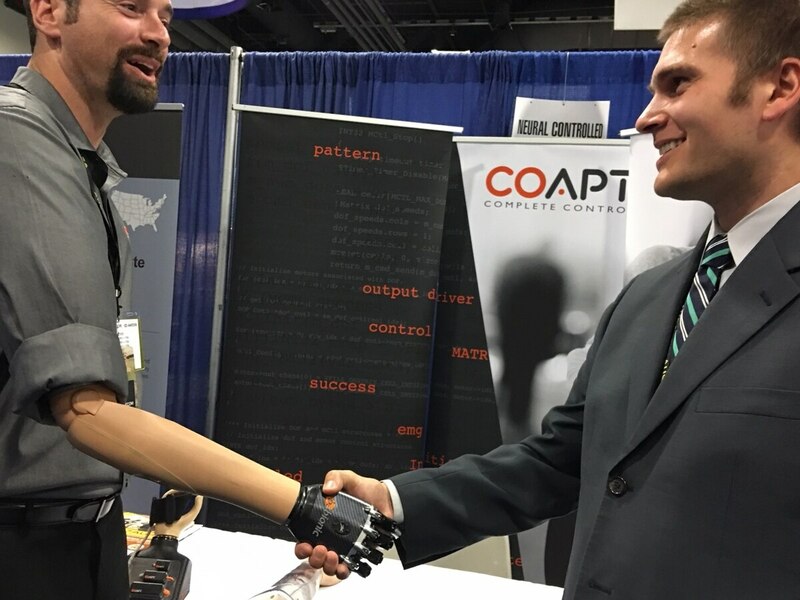 The Coapt system makes it easier for amputees to be functional with their prosthetic, he said. There are other benefits to the technology, he said. It reduces the amount of time an amputee would need to spend with a clinician. With advanced robotic technology, the challenge is how you make the neural connection to the user, and make it effective, said Blair Lock, CEO of Coapt. A noninvasive array of electrodes decodes the neurological information sent to it to permit prosthetic control, Lock said. The more the user wears it, the better it gets, Lock said. It’s an advantage over the incumbent style of prosthetic control, and has a calibration feature not normally found in prosthetics, Lock said. Training is virtual-game based. The system is sold as an add-on kit that fits into many of the prosthetic devices on the market. It is commercially available, said Jason Ghannadian, science officer at Army Medical Research and Materiel Command and Congressionally Directed Medical Research Programs. The technology is not new, and the system has been available for about four years, he said. Those interested in using the system should talk to their clinician, Lehman said.